Get up close and personal with a DIYLILCNC in action! 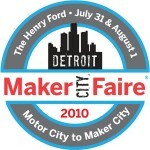 Taylor Hokanson and Chris Reilly will be running demos, answering questions, and having fun at Maker Faire Detroit 2010. Saturday, July 31st 9:30 a.m. – 8:00 p.m.
Sunday, August 1st 9:30 a.m. – 5:00 p.m.